Welcome to NPIN’s one-stop shop for Hepatitis widgets, logos, eCards and more! Simply follow the instructions provided in each section to add the following Web tools to your organization’s website. NPIN widgets provide a way for you to direct your web visitors to HIV, viral hepatitis, STD, and TB testing and treatment services. A widget is an online program that provides customized information and can be easily added to your Web site. The results display within the widget, so visitors do not leave your Web site. The widgets automatically update, so rarely if ever require your maintenance. Another way to help promote STD and HIV testing is to add a search box to your site. The search boxes are similar to widgets except that when visitors enter a ZIP code to find a testing location, they will be directed to a results page on gettested.cdc.gov. 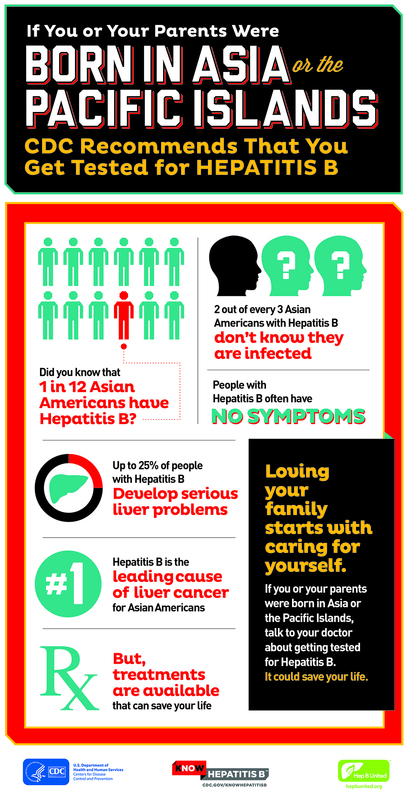 Infographic CDC's Division of Viral Hepatitis on Hepatitis B directed at children of immigrants. Visit CDC's Division of Viral Hepatitis for other Know Hepatitis B campaign badge options. Promote National Hepatitis Testing Day May 19. Multiple Hepatitis Testing Day badge options are available from CDC's Division of Viral Hepatitis. This widget from CDC’s Division of Viral Hepatitis offers an interactive quiz on viral hepatitis. Promote Hepatitis Awareness Month. Find more badges from CDC's Division of Viral Hepatitis.